The title compound, erioflorin, C19H24O6 [systematic name: (1aR,3S,4Z,5aR,8aR,9R,10aR)-1a,2,3,5a,7,8,8a,9,10,10a-decahydro-3-hydroxy-4,10a-dimethyl-8-methylidene-7-oxooxireno[5,6]cyclodeca[1,2-b]furan-9-yl methacrylate] is a tricyclic germacrane sesquiterpene lactone which was isolated from Podanthus mitiqui (L.). 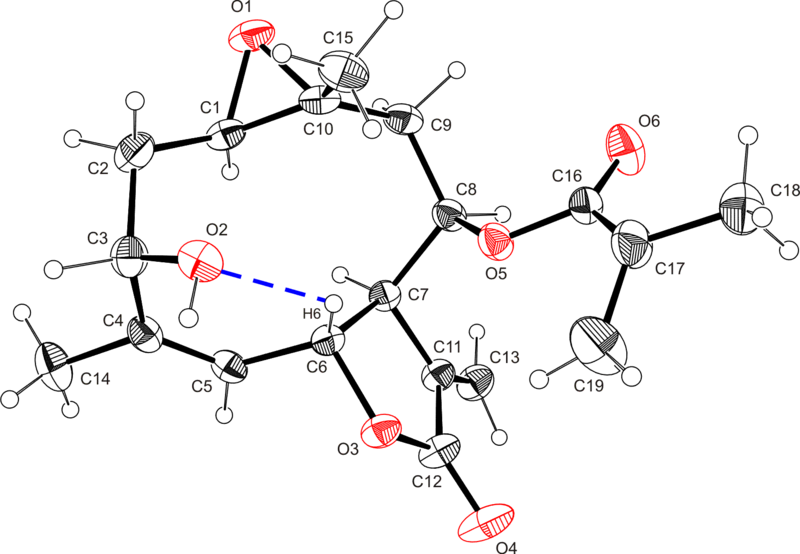 The compound crystallizes in the space group P212121, and its molecular structure is basically a methacrylic ester of a ten-membered ring sesquiterpenoid annelated with an epoxide between C1---C10 and a butyrolactone between C6---C7. The molecule is stabilized by one hydrogen bond. Further intermolecular hydrogen bonds can be observed in the packing.